We’d love your help. 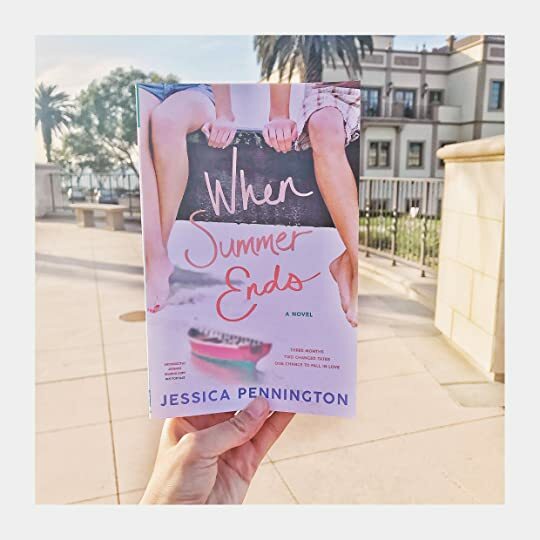 Let us know what’s wrong with this preview of When Summer Ends by Jessica Pennington. Straight-laced Olivia thought she had life all figured out. But when her dream internship falls apart, her estranged mother comes back in Aiden Emerson is an all-star pitcher and the all-around golden boy of Riverton. Or at least he was, before he quit the team the last day of junior year without any explanation. How could he tell people he's losing his vision at seventeen? To ask other readers questions about When Summer Ends, please sign up. ➽ Aiden - Starting pitcher for the varsity baseball team, but his true passion is drawing. He has felt an immense amount of pressure to live up to everyone else’s baseball expectations, but after a playing accident, instead of spending the summer away at baseball camp, he is going to be working at this dad’s company, River Depot. Which becomes extremely popular with tourists ever summer. ➽ Olivia - Lives with her aunt, who just received an amazing job opportunity in Arizona, which means this could very well be the last summer in Michigan for her. Her estranged mother agrees to stay with her, while she tries to enjoy the summer working at none other than River Depot with Aiden. I give this book 4.5 stars which rounds up to 5. This book was so damn cute. Aiden and Olivia had such a cute relationship. Like that is the teen summer romance that I have always wanted. They were so good together and brought out the I received an ARC of this book for free as part of a Storygram book tour. This was such a cute and sweet read! It warmed my heart this winter- with its sunshine and summer feel. In When Summer Ends, we follow two teenagers Aiden and Olivia - who discover how an unexpected turn of fate can bring new love to heal old wounds. I really enjoyed the characters and the book as a whole was just a quick fun read. The writing was simple and flowed nicely. The story was about how when you're in high school you think your life is headed in one direction but then so 4 Stars!! In When Summer Ends, we follow two teenagers Aiden and Olivia - who discover how an unexpected turn of fate can bring new love to heal old wounds. I really enjoyed the characters and the book as a whole was just a quick fun read. The writing was simple and flowed nicely. The story was about how when you're in high school you think your life is headed in one direction but then something happens and it makes you rethink where you are headed. Or in this case, make you wake up to realize there is more to your future than you thought there could be. I totally recommend this one! I loved this adorable book! The only bad thing was reading in the winter instead of summer. It made me miss the warm weather even more. I read Jessica's Love Songs & Other Lies and really enjoyed it, but I liked this one even more. The book starts off with Olivia getting fitted for a bridesmaid dress for her boyfriend, Zander's, sister. Olivia and Zander started off as friends and then started dating a couple year I loved this adorable book! The only bad thing was reading in the winter instead of summer. It made me miss the warm weather even more. I read Jessica's Love Songs & Other Lies and really enjoyed it, but I liked this one even more. The book starts off with Olivia getting fitted for a bridesmaid dress for her boyfriend, Zander's, sister. Olivia and Zander started off as friends and then started dating a couple years ago. His family always wanted them together and Olivia feels like they are her family, too. She lives with her aunt because her mom took off to "find herself" and she doesn't know her dad. So Zander's normal family makes her feel normal, too. Olivia finds out that her aunt got a job in Arizona and she may have to move away. She asks Zander if she could stay at his house and he basically breaks up with her. He doesn't think a long distance relationship is possible. He leaves for his family's lake home right after this. Aiden is the star pitcher for his school. He's only a junior, but everyone talks about him. He's Emerson on the field. He ends up getting hit in the face after pitching a bad game that ended their season. What no one knew was that Aiden is having vision problems. Not one that can be corrected by glasses or surgery. He's getting shots that will hopefully help, but he can't drive and quit the baseball team. Aiden gets a job at his family's business for the summer and wants to focus on his art. Olivia ends up working with Aiden. She doesn't really know him well at first, but they start spending a lot of time together. He doesn't tell her about his vision and she doesn't mention the break up. They start growing closer. Aiden involves her with his art and she talks to him about her writing and her family issues. But she never tells him that she might have to move. Her mom also shows up and Olivia is trying to find a way to be around her without the resentment. I also have to mention a couple side characters. I would read a book featuring these two. I loved them that much. Olivia's best friend, Emma, was just fun. I loved their friendship and wish we would have seen a little more of that. Ellis is Aiden's cousin and he also works at River Depot. I adored him, too. I actually loved this so much more than Love Songs & Other Lies! It reminds me of Sarah Dessen. Be sure to add my debut novel, Love Songs & Other Lies to your TBR, it's full of music, slow-burn romance, swoony boys in bands, and second chances! If you're excited for WHEN SUMMER ENDS, be sure to follow me on Twitter and Instagram where I'll be sharing sneak peeks, inspiration, giveaways and more as it gets closer! And for the first shot at ARCs and behind-the-scenes news, sign up for my monthly newsletter! Trigger warning: Suffering injuries from a sport. Till the point I read. I received this E-ARC via Macmillan-Tor/Forge and Netgalley in exchange for an honest review. I read the authors debut and didn’t enjoy it. Still this one sounded promising and I wanted to give it a go. Unfortunately this author isn’t for me. This is a personal thing. Still recommend. I'm really glad I was reading this when we had some rare sunshine because it made it feel like summer. It was a cute romance and would make for a great summer read. I absolutely loved this. Such a wonderful story of family, friendship, love, and new beginnings... with a whole lot of swoon. Jessica Pennington is officially an auto buy author for me! I can’t wait to see what she writes next! Full review to come! This was a ‘surprisingly’ sweet, quick and ultimately fun character driven read that totally hooked me from page one and made it very hard for me to put to the side because I really wanted to see how things would end up for Aiden and Olivia, not only with their relationship, but to see who they’d become at the end of the summer. Aiden and Olivia. It was hard not to like these two. Both are really good kids who fate, fickle biyatch that she is, has decided to toss a couple of curve balls at and now have to figure out new paths to follow which ends up leading them to each other. I thoroughly enjoyed watching as their relationship evolved throughout the story and how it helped them to gain more insight on who they wanted to be as individuals. Their bantering was all kinds of fun and sweet and I just really liked how well they flowed together throughout the story. Of course things aren’t smooth sailing for these two, from outside interference to their own decisions on how to deal with things, but, in the end, I really liked how everything worked out for them. This is my first read by the author and I thoroughly enjoyed it. It was sweet, funny and quite low on angst, which was a welcome change of pace. While this is YA, it does lean towards the more mature end of the spectrum, but not so much that they had crossed the line into NA side of the coin too much. The supporting cast of characters were all well written, from the adults to the teenagers, but my favs were Ellis and Emma hands down. So, if you enjoy YA and are looking for something that isn’t super angsty, then this will be the read for you. 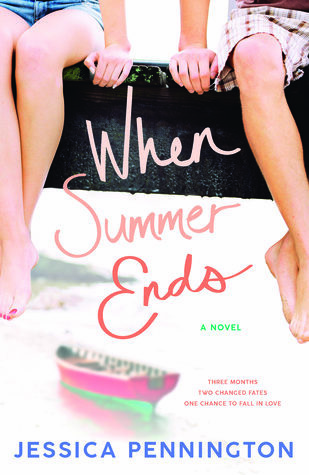 I was so delighted to be able to get an arc of When Summer Ends by Jessica Pennington. I am not a full fledged YA contemporary person, I’m sorry it’s true, I sometimes find it hard to relate to the characters and story. BUUUTTTTT Jessica is an exception. I read Love Songs & Other Lies last summer and absolutely fell in love with it and with Jessica's writing. Aiden has always played baseball but when his eyesight starts to lessen it becomes clear to him that the future he thought all writte I was so delighted to be able to get an arc of When Summer Ends by Jessica Pennington. I am not a full fledged YA contemporary person, I’m sorry it’s true, I sometimes find it hard to relate to the characters and story. BUUUTTTTT Jessica is an exception. I read Love Songs & Other Lies last summer and absolutely fell in love with it and with Jessica's writing. Aiden has always played baseball but when his eyesight starts to lessen it becomes clear to him that the future he thought all written out must change. Olivia had it all figured out but when her aunt and guardian tells her they will be moving to the other side of the country and her boyfriend decides to call it quits, everything she planned out goes to pieces. For the first time in her life Olivia lets chance decide one coin flip at a time. Though Aiden and Olivia know each other from school, they actually know nothing about one another. That is until both start to work at River Depot for the summer and are paired together. As they get to know one another, they both start to see how wrong their opinion of the other was. Olivia and Aiden are just the cutest thing, I swear this relationship had me squealing like a school girl LOL. Aiden is the guy that you assume is a jock through-and-through but as we get to know him you definitely start to see that sports and joshing around with the guys isn't really what he's about. Olivia is the typical quirky girl but the way that her character is written still seemed fresh and relevant to me. Right from the start you can see that these two are just perfect for each other even if they don't know it yet. Like in Jessica's previous book, When Summer Ends alternates between both Aiden and Olivia's point of view. I do quite enjoy this balance in YA contemporary as it gives you a deeper perspective in the relationship. It made me sometimes scream at one of them to go talk to the other or give them advice on what to do next, it's clear to say that I was way too invested in this relationship. One thing that I love about Jessica' writing is she always puts a grand gesture somewhere in her book which reminds me of 80's & 90's teen movies and the one in When Summer Ends is just the cutest. I won't tell you what happens but I'm hoping that she continues to do this since I find it very unique and now identify it with her style. Before When Summer Ends I don't think I ever thought about going to Michigan. After reading it only thing I can think of is visiting that state, hopping in a canoe and having a bonfire on a secluded beach somewhere. If you are looking for a good summer book to bring on vacation or the beach, I really recommend that you pick this one up. Jessica Pennington is definitely on my auto buy author list. If you are a fan of authors like Kasie West, Jenny Han and Stephanie Perkins you should check out Jessica's books. I gave it a 5 out of 5 stars. This went from being a summer of woe to a summer of OH for both Olivia and Aiden, and I really enjoyed having the opportunity to accompany them on this journey as they embraced their new beginnings. • Pro: Pennington did a great job crafting these characters, because the empathy flowed instantly from me for both Aiden and Olivia. They were dealing with some big changes, and I was glad they had each other for support. I did think the stakes were a little higher for Aiden, but I also thought he wa This went from being a summer of woe to a summer of OH for both Olivia and Aiden, and I really enjoyed having the opportunity to accompany them on this journey as they embraced their new beginnings. • Pro: Pennington did a great job crafting these characters, because the empathy flowed instantly from me for both Aiden and Olivia. They were dealing with some big changes, and I was glad they had each other for support. I did think the stakes were a little higher for Aiden, but I also thought he was less resistant to embracing the changes than Olivia. She did come around, slowly but surely, and I was really happy with the growth she experienced. • Pro: Aiden's art adventure was fabulous! First, we got to attend ArtPrize, but we also were treated to Aiden's grand-scale artistic endeavors, and it was all really wonderful! • Pro: I have never been to Michigan, but Pennington definitely painted an amazing picture for me. I was sort of glad Aiden and Olivia worked outdoors, because I had a great time exploring the lake, river, and beaches with them. • Pro: The romance was so sweet, and I was shipping these two right away. I just loved them together, and Pennington really had me feeling those first romantic stirrings right along with them. I had my fingers and toes crossed for these two, because they were such a great pairing, but facing quite a few obstacles. • Pro: Part of Olivia's growth was with respect to her relationship with her mother. This was a complicated mother-daughter dynamic, and I liked the way Pennington let it play out. • Pro: The ending made me really happy. Pennington knew the way to my heart, when she not only gave me a jump-ahead ending, but a good one at that. Overall: This was a such a wonderful and enjoyable story about friendship, family, love, embracing change, and taking chances, and I adored every second of it. I have so much love for this book I can't contain it. Honestly, I really just want to talk about how much I love this book in a million different ways, but I'm sure you would get totally tired of it by the 20th reason. Seriously though, this book was amazing. It blew me away. I read it in 2 sittings, and it was really hard for me to not just stay up all night and read it. This book had everything you need for a perfect contem I received this e-book from NetGalley in exchange for an honest review. I have so much love for this book I can't contain it. Honestly, I really just want to talk about how much I love this book in a million different ways, but I'm sure you would get totally tired of it by the 20th reason. Seriously though, this book was amazing. It blew me away. I read it in 2 sittings, and it was really hard for me to not just stay up all night and read it. This book had everything you need for a perfect contemporary. Our POV's in this book are Olivia and Aiden. Olivia lives with her aunt and has the perfect boyfriend. She has been best friends with him since they were kids, and of course, was in love with him then. In high school, she finally becomes the girlfriend. Oliva feels like she has a perfect life until she finds out her Aunt is moving them away her senior year for a better job, and her "perfect" relationship falls apart. She decides to make her summer full of fun and let her coin tossing guide her. Aiden is the all-star pitcher for his high school team. He is super popular in school and is an all-around nice guy. When he finds out he is starting to lose his vision, everything he thought he wanted to do changes. He has to quit the team but doesn't want to tell them why. The rumor mill starts, but he doesn't really care. He decides over the summer to find out who he is without baseball. But of course, he ends up working all summer with Olivia, which he thinks is going to ruin his whole summer. Once Oliva and Aiden's story intertwines you will fall in love with these 2 so quickly if you already haven't. I pretty much fell in love with these characters from the beginning. If you are a fan of any of Kasie West's books you will most definitely love this book. Jessica, like Kasie, has a way of writing this super predictable book with so many little surprises sprinkled in. She writes characters that you can't help but love and can easily connect with them. I laughed so much in this book, but I also cried my eyes out a few times. I highly recommend this book! There is no way you won't love it as much as I do. I cannot wait to read Jessica's other book, and I am so excited for more to come. She will definitely be on my auto-buy list! A cute book that has me ready for summer. I liked the premise. It was a nice, fluffy book without too much emotion or heaviness attached. However, in the same breath, I could say there wasn't enough emotion attached. I didn't really care that much about whether Olivia moved or not, or whether she ended up with Aiden or Zander. I mean, it kept my attention and kept me turning the page, but not with an avid desperation to find out what happened. The story is told from two perspectives, that of Oliv A cute book that has me ready for summer. I liked the premise. It was a nice, fluffy book without too much emotion or heaviness attached. The story is told from two perspectives, that of Olivia and that of Aiden. I really like when books do this, adn the author does a great job of keeping the voices easy to differentiate. But sometimes the jump between characters lost timing for me. Let me explain. Sometimes when the point of view went back and forth between Olivia and Aiden, it was from one moment to the next, continuing in the same scene. Other times, when the point of view changed, it would be in a completely different scene, setting or even day, but without any notice or explanation. One moment Aiden and Olivia are talking. Then the next point of view change, Olivia is with her mom or aunt or friend. I'd have to go back and read the last paragraph of the scene before to see if I missed something, but no, it just jumped. Those times were a little confusing and perhaps should have been flushed out more in editing. This is an engaging story with two adorable young people, each facing their own challenges. Aiden is just an awesome hero, not at all the stereotypical star pitcher, as the author gradually shows us. Olivia is a great heroine, too. The slow build up of their relationship feels authentic and their HEA is well deserved. I would have liked to have seen a more thoroughly explanation about Aiden’s vision problem; after finishing the book, I "Received an Advance Reader Copy in exchange for a fair review"
I would have liked to have seen a more thoroughly explanation about Aiden’s vision problem; after finishing the book, I’m not even sure about the precise diagnosis. Loved, Loved, Loved! This was such a sweet treat from characters to all the summer vibes. Thank you so much Jessica for sending me an arc! I adored the story, it gave me all the feels. In the end I was balling my eyes out but I was also smiling from ear to ear. I really enjoy the two POV from Olivia and Aiden. This was such a fun, summer read and made me really want to go visit Michigan! This story was adorable and sweet, but still a page-turner. I loved Olivia and Aiden from the start, but together they fit like puzzle pieces. The setting was rich and the characters had depth. If you like Sarah Dessen and Kasie West--you're going to want to read this one as soon as you can--I can't wait for the next Pennington novel. This precious book absolutely warmed my heart and left such a big smile on my face! 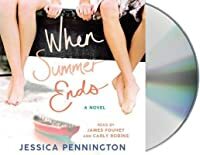 When Summer Ends by Jessica Pennington was the perfect cozy beach read and I was smitten with writing, the adorable characters, and the beautiful sceneries. Here’s a little confession – I was approved for Love Song and Other Lies through Netgalley when I first started writing reviews and got a little carried away requesting for all the books I wanted to read. I never expected to get approved for so many and then This precious book absolutely warmed my heart and left such a big smile on my face! 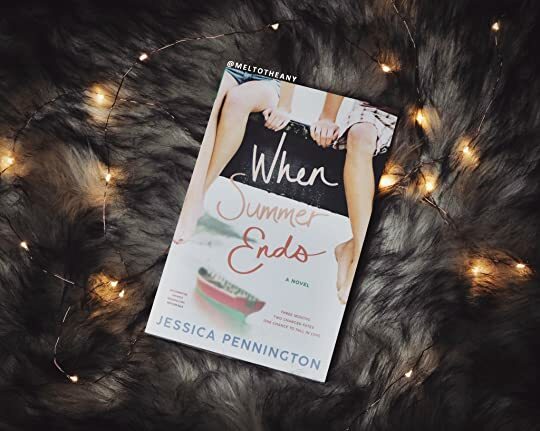 When Summer Ends by Jessica Pennington was the perfect cozy beach read and I was smitten with writing, the adorable characters, and the beautiful sceneries. Here’s a little confession – I was approved for Love Song and Other Lies through Netgalley when I first started writing reviews and got a little carried away requesting for all the books I wanted to read. I never expected to get approved for so many and then BAM!! I had way more ARCS than I ever expected and I was overwhelmed. I’m still quite behind, but I’m slowly making progress. Anyway, I mentioning this because I LOVED When Summer Ends and Pennington’s writing is utterly beautiful and so wonderfully touching. I have a new to me author to add to my favorite list and I’m so excited to read whatever else she writes and to FINALLY read her debut novel this summer… which is when I’m planning on tackling my Netgalley TBR. Okay, so now back to my review. You already know I loved the writing which was also really easy to read and had a lovely effortless flow. I thought the imagery, setting, and all the descriptions of the places were amazingly detailed and very fascinating. I felt like I was going on an adventure and exploring with Aiden and Olivia. From paddling down the river, swimming in the dark, and hiking to Aiden’s favorite places – I enjoyed every moment and had so much fun! The plot was a bit slow at times, but definitely not dull and never uninteresting. It was filled with fun lighthearted drama, adorably funny scenes, and sweet tender moments. I actually thought this would be emotionally heavy, but even though it wasn’t, it still made me cry. I liked and did not like the ending. Something happened that just made me feel like it was too convenient and I was hoping for a different, but still a HEA conclusion. Overall, I did think it wrapped up nicely and I was happy for the characters. I LOVED Aiden and Olivia as individuals and as a couple. I really enjoyed their friendship and romance. I loved seeing them do new things and take chances. It was really nice to see how their relationship grew into something more. It was perfectly slow burn and the FEELS were totally amazing! They were so wonderful, intriguing, and likable. I loved their chemistry, their bantering, their playful flirtations, their swoony scenes, and all their adorable moments together. I thought they were so cute together and it was positively endearing to watch them not only learn from each other but also challenge each other to be better. I love books that can make me feel connected to the characters and experience all their emotions. When Summer Ends did not disappoint and filled my heart with so much happy I can’t stop smiling just thinking about it. It was a beautiful story about moving on, taking chances, chasing new dreams, and falling in love. When you think everything seems to be falling apart, just remember that there might be something better -- an unexpected new beginning or a wonderful surprise waiting for you. I really loved this book and Jessica Pennington is without a doubt an amazing storyteller that needs to be added on your TBR list! This was a fun and sweet summer romance story with plenty of swoons that I think many contemporary romance fans will enjoy. It was heartfelt, absolutely charming, and a delightfully affecting read. I received an advance reader copy of this book from the author and publisher via Netgalley in exchange for a fair and honest review. All thoughts and opinions are my own. Thank you so much to Macmillan-Tor and NetGalley for providing me with a copy of this book in exchange for my honest review. I tried really really hard to like this book. It sounded like the perfect summer read with some parental problems and health problems thrown in to the mix. But it honestly fell short for me. I couldn’t get into the story and honestly questioned a couple of times why I was still reading it. Olivia’s mom has never really been in the picture so she’s lived with her Aunt since Thank you so much to Macmillan-Tor and NetGalley for providing me with a copy of this book in exchange for my honest review. Olivia’s mom has never really been in the picture so she’s lived with her Aunt since she was young. Her boyfriend’s family has always filled that void for her until they break up and she finds out she doesn’t get to work at the job she’s been waiting for all year. After getting a different job at the River Depot she finds out her ex-boyfriend’s best friend Aiden also works there. Aiden has just quit the baseball team due to his ailing eye sight and is at a loss since baseball has been in his life forever. Once the two of them start working together they realize how much they enjoy spending time together but what will happen when summer ends? I understood the whole plot and storyline of this book but I still didn’t enjoy it that much. It felt like every time there was a problem in the book it was immediately solved and then you moved onto another problem, which was immediately solved as well. There was no drama to it and honestly at times I forgot what this whole book was about because it felt like it was a lot longer than it needed to be. Do you ever just read a book, and it just totally works and makes sense.. you're able to relate to it on so many different levels? This novel was that for me. I loved this novel; seeing sunsets and giant goldfish <3 (you will understand once you read). It was equal parts, heartbreak and learning to love yourself, letting go of past hurts, leaping into the future and just living day by day. Liv is such a likeable main character. She is very much in her head and worries about things she can't co Do you ever just read a book, and it just totally works and makes sense.. you're able to relate to it on so many different levels? This novel was that for me. Liv is such a likeable main character. She is very much in her head and worries about things she can't control. This is her Summer to let go and let fate decide, but in the process she also learns so much about herself. Aiden the other main character point of view in this story is my favourite. He is the golden boy of the town, he is sweet and sarcastic. He is also going through a lot and for me his character was the best part of this novel. I relate a lot to Liv and her struggles. She is always over-thinking everything and wanted to know everything, instead of just living. Her first serious relationship, she was all in with Zander and his family. She spent more time with his family and felt more at home there than at her actual home. My first relationship, I was so close with his family; his mom was like my mom, his brother was my little brother. When things ended, I didn't know how to go back to not having these people in my life. And his family and me tried to make it work after the break-up, but everything had changed and nothing felt the same anymore...especially once we both starting dating other people. Ms. Pennington has such a gift in how she describes everything. As a reader you feel like you a present in the canoes or on the baseball field. I loved the entire experience of reading this novel. Seeing Liv grow and learn new things about herself was really eye opening and such a joy to read. I was 'squeeing' the entire novel because it was so fantastic. Aiden is a lover of sports, the arts and the outdoors. He brings out so many good qualities in Liv and she in him, that I was smiling the entire time. Even though I don’t usually read romance novels, the synopsis of this one immediately caught my eye for dealing with themes like parental neglect and vision loss. It also looked like the perfect book for one of those times when I want a lighter and happier read that’ll leave me with a good feeling, so as soon as that time came, I started to read it very excited. Unfortunately, When Summer Ends only accomplished half of my expectations. Let’s start with the positive part: it’s a light novel, perfect for when you need to disconnect or get out of a reading slump. The romance between the main characters is pretty healthy in general, there’s not a lot of unnecessary drama and the scenarios described make you feel as if you were spending your summer canoeing in the lakes of Michigan. I also liked the artistic element in all its forms, from Aiden’s drawings to Liv’s stories, and the fact that they let fate decide for them by coin flips. Another small detail I appreciated was the fact that Aiden’s cousin was gay without falling into the “gay best friend” cliché. So, if you’re into novels that heavily focus in the romantic aspect, you might enjoy this story. However, I prefer other themes aside from the romance to be explored, and here’s where my first and biggest problem with this book arises: they barely give importance to Liv and Aiden’s problems. Liv’s subplot with her mother isn’t explored at all and the “resolution” is way too easy and, in my opinion, not really believable. In fact, it could be completely erased and the story would barely change. While it’s true the story goes a bit more in depth in Aiden’s vision loss, it doesn’t give it the importance I would’ve liked either and it ends up being temporary. Another thing I was a bit disappointed by was that, despite having other interesting elements like writing or the relationship with her aunt, Liv’s story seemed to revolve only around her love life – we only know about her past relationship, her best friend and her seem to talk just about that… We’re barely told the rest, but we never get to see it, which makes Liv a pretty flat character. Had I connected more with the main characters and gotten more involved in their relationship, I would’ve given the book a higher rating, but… to be honest, they were really boring to me. I couldn’t be interested in their relationship because they weren’t interesting enough as individuals. I really enjoyed reading this book. I used to live in Michigan by Lake Erie, so the Michigan summer aspect of this gave me all of the memories from the summers I had growing up. One of the misgivings I had with this book was that I did have to put it down for a bit because I wasn’t quite in the mood for this book yet and it wasn’t the right time to read it yet so I had to find something else to read. It wasn’t anything to do with the author or the way the book was written, but that is mostly why I really enjoyed reading this book. I used to live in Michigan by Lake Erie, so the Michigan summer aspect of this gave me all of the memories from the summers I had growing up. One of the misgivings I had with this book was that I did have to put it down for a bit because I wasn’t quite in the mood for this book yet and it wasn’t the right time to read it yet so I had to find something else to read. It wasn’t anything to do with the author or the way the book was written, but that is mostly why it’s a four star rating instead of a five star rating. I feel like YA novels don't get the credit that they deserve sometimes. YA novels, especially romance ones, leaves the reader with a happy feeling. The books tend to wrap up nicely and everyone is happy. That is how it was with When Summer Ends. When Summer Ends was my first Jessica Pennington book, but it won't be my last. I enjoyed reading Olivia and Aiden's story. Olivia has her perfect life until it all comes crashing down. Now working at I received this book in exchange for an honest review. This story was cute, in that super cute YA summer novel type thing. If you're a fan of all the boys I've loved before, you will probably like it. There were some holes near the end, of things that I wish I knew happened or turned out but overall I would recommend it to someone looking for a quick, nice and easy contemporary story. The only downside is I wanted a little bit more to the story, when I ended I was like wait what? I needed more of these characters in my life@ But the story can be real This story was cute, in that super cute YA summer novel type thing. If you're a fan of all the boys I've loved before, you will probably like it. There were some holes near the end, of things that I wish I knew happened or turned out but overall I would recommend it to someone looking for a quick, nice and easy contemporary story. Super cute summer romance story. I loved the Michigan beach town summer setting! As someone from Michigan, it’s exactly something you’d see and it was charming! Aiden has an eye disease (shared with the author) which was nice to see some rep for this in a book. Because of it he’s unable to drive or play baseball anymore, but he’s able to pursue his love of art. Olivia has been basically deserted by mom and deals with rejection and situations out of her control. Olivia gets a job at a c 3.5/5 stars! Olivia gets a job at a canoe rental place where she meets Aiden. I enjoyed many aspects of this book. I only wish the relationship between Olivia and her mom had been explored a little more. I really loved When Summer Ends. It was a smart, fun and heartwarming contemporary read. Olivia was a lot of fun and I LOVED Aiden. I really enjoyed watching their friendship blossom. My favorite contemporaries are the ones where you root for the couples. When Summer Ends is definitely an example of where you need these two to work out! When Summer Ends is a lovely sweet romance about to almost seniors. Aiden and Olivia know each other for years, because Olivia's boyfriend is a part of the same baseball team as Austin. Each struggling with their own problems they decide the live the summer by chance. I loved this book. It was sweet and I loved Aiden and Olivia. The writing was also very good. This was my first Jessica Peddington book but after this one it certainly won't be my last. “If someone rescues someone, the reader expects that one of three things will happen. Right. Well, they can become best friends, they can fall in love, or...they'll end up killing them. Which of the three do you think happens for us?